Sheriff Pat Kelly is regarded as one of the most corrupt sheriff's in America. Those who regard him that way don't have a clue. The most corrupt sheriff's in America are out there committing corruption day in and day out, and no one is doing anything about it. There are 3,144 county sheriffs in America. Bill Windsor reports that every sheriff he has ever personally encountered has been corrupt, so he doubts that there are many truly honest sheriffs in the 3,144, and he believes there are many corrupt sheriffs, like Ellis County Texas Sheriff Johnny Brown. 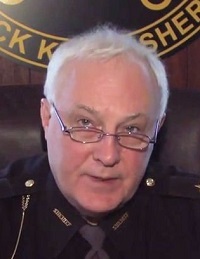 Former Athens county sheriff Pat Kelly An Ohio jury found Athens county sheriff Pat Kelly guilty of 18 charges on Friday, addressing about a third the crimes he stood accused of committing. Indicted in late January 2014, Kelly, 64, faced 25 charges ranging from money laundering to tampering with records from 2008 through 2013. The county suspended him from office in 2013. While the jury ditched most of the charges with larger implications, such as tampering with records, they held fast to Kelly's long list of corrupt activities, finding him guilty on 8 counts of theft, perjury, and engaging in a pattern of corrupt activity. Kelly, in his sixth year as sheriff, claims he used the stolen funds to compensate informants helping him investigate illegal drug activity. The jury, however, agreed that the former sheriff pocketed the cash from police vehicle sales as well as converted campaign check for his personal use. He spent the money, almost $14,000 intended to keep the department running, on meals, Ohio University polo shirts, and a retirement party. "This is a public corruption case. This is a serious case. What we allege is a pattern, a long-standing pattern," Ohio attorney general Mike Dewine, who brought the charges, told the local NBC affiliate. Scrambling, Kelly took to Facebook to slam Dewine and tried to play the charges off as political stunt. "Sadly, the Attorney General's obsession with following a political agenda suggest that their leadership is not up to the kind of honest investigation and oversight that would lead to a clear and just assessment of the facts presented," Kelly said in an official response to the indictment. He also said neither him nor anyone in his office had committed a crime. With the verdict out, Kelly can't ever return to his near $70,000-a-year position.